Washington State is known for many things including great coffee, beautiful scenery and of course, our very wet winters. 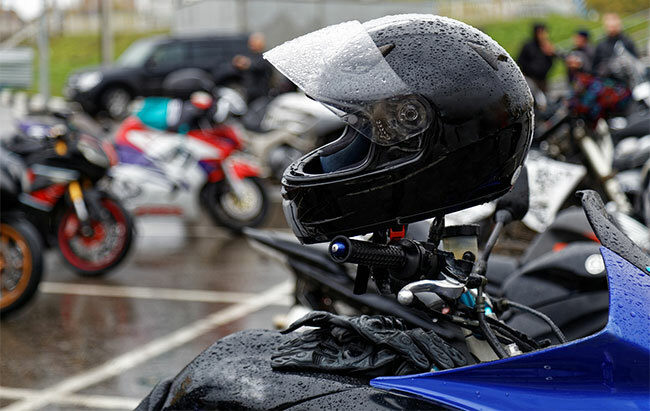 To many motorcyclists, riding in the rain can be intimidating, but with the right prep and planning, you can enjoy riding your motorcycle in the Pacific Northwest year round. Get the Proper Gear. The motorcycle protective gear you decide to wear can make or “brake” your riding experience. Waterproof gear is nice, but high-visibility waterproof gear is even better. Try swapping out your clear face shield for a yellow or orange one and treat your goggles or shield with an anti-fog. A brightly tinted face shield will increase contrast and allow you to see hazards better. Stay Calm. Getting caught in a sudden rainstorm on your motorcycle can be stressful. But it’s important to remember that the road is slick and any sudden, tense movements can mean disaster, so try to stay loose. Holding onto your handlebars too tightly can tire you out and cause your maneuvers to be more rigid and abrupt. Plan Ahead. In the winter, it’s crucial to always check the weather before you set out for your ride. Be sure to always pack proper rain gear, even if there is the slightest chance of rain. If it’s the first rain in a few days, wait a couple hours before heading out as there will be more oil and dirt built up on the road and a higher risk of losing control. Check Your Lane Positioning. Note that tire tracks on the road are usually the best line to follow as they have less water pooled up and are normally positioned away from the center of lanes where oil tends to build. Stay away from slick surfaces like painted lane lines and keep an eye out for puddles and avoid them whenever possible – a small puddle can mask a deep pothole. Make Smooth Transitions. Even simple maneuvers like accelerating, shifting and braking can be dangerous in the rain. Remember that your motorcycle braking distance is even longer on slick wet surfaces, so cover your brakes and give yourself more time and space. If you have to make a sudden stop, brake more heavily in the rear – you are more likely to recover if your back tire spins out than if your front tire does. Slowing down completely when you’re approaching a curve in the road or making a turn can be very helpful as well. I ride a Victory cruiser, and Carhartt construction raingear is about the best if you “plan” on riding in the rain. Keeps me dry from A to B and it bright yellow for visibility. I also invested in Carhartt cold weather gear; quilt lined coverall, rated up to -41 degrees. What wind chill factor? 15 year all weather rider. Tire groves in the road are going to pool water. Ride the edges. I thought that too, who thinks tire tracks don’t gather water?…. yes, ride next to the grooves not in them! Agreed! Stay just a bit to the side of these “ruts”! I’ve invested in First Gear nylon pants and day-glo Kilimanjaro jacket. I’ve been able to stay dry for hours and warm. Railroad tracks trolley and movable crane trackstracks (near the docks or waterfront) are a particular hazard when they are wet. If you don’t cross them as perpendicular as possible (even at slower speeds) your rear tire can slide out unexpectedly and you can find yourself sliding sideways. When and if you regain traction you may end up high siding. Most of the time I like to use my hand signals when I am riding anywhere near other cars. But, when it is raining outside or when im in traffic, I ALWAYS use my hand signals. I just don’t trust my blinkers enough to be confident that others will be able to differentiate between me turning left or right. A bike has such a narrow profile and thw distance isn’t very far from your left and right blinkers. ESPECIALLY if you have a sport bike like me that has an after market integrated tail light. My blinkers are merely 6 inches apart. Besides if you are sticking your arm out the chances are that most people will see the movement of your arm and naturally just look over at you to see what the hell your doing. Lastly, if you are riding with other riders or maybe you just happen to end up in front if another rider on the freeway, it’s a good idea to use your hand signals to prevent any guessing or assuming. Ride safe everyone. Frogg Toggs are always in my side trunks, always…..an electric vest from October to March. I try and ride year round, and take great pride in it! Never said I was smart!